All products shown on our site are individually made to order at our workshop in Bristol. We aim to despatch finished orders within 24 hours of receipt, when we have packaged you order we will email to let you know (orders sent first class Royal Mail, if you have not received your order within 7 days please contact us). We do ship internationally and our online shopping cart will calculate delivery cost based on your country. 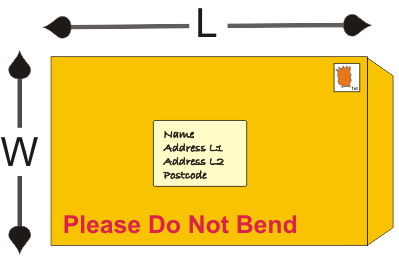 For protection in transit we ship all our labels in cardboard backed envelopes, envelope size will depend on goods ordered but typically will fit through domestic letter boxes. With reference to the picture below, we use two standard envelope sizes, small at 165mm x 235mm [W x L], and large 230mm x 320mm. If your order arrives damaged in transit, we will replace it free of charge or offer you a partial or full refund. Please contact us within seven working days of receipt of your order with details of the damage and keep ALL the original packaging (photos of the damage would be appreciated). Returns are made at your expense, although we may waive this responsibility in certain circumstances. Any order supplied that does not meet the agreed specification will either be replaced free of charge or be subject to a full or partial refund of the purchase price. Please inform us by e-mail within 7 days of receipt stating clearly the reasons for rejection (alternatively the complaint may be sent by mail to the address shown on the ‘Contact Us’ page). Complaints will be acknowledged within two working days. All our products carry a 21 day no quibble money back guarantee. In addition to this we guarantee the structure of all products for 1 year against pealing or fading.